Since its inception in 1997 the Honda CRV problems that have been recorded and have shown to be common problems, for the most part have been quick fixes, have had TSB's (technical service bulletins) or were corrected through recalls. Honda has had much better then average reliability and owner satisfaction ratings from its Japanese built CRV(1997-2006 models). 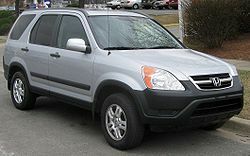 The third generation CRV is now being built in the United States and has been well received. Read below for common CRV problems, TSB's and Recalls for each generation. First generation 1997-2001, Second generation 2002-2006, Third generation 2007-present. -The engine valves sometimes fail prematurely. The cylinder head will need replacing because of wear in the area where the valves seal. Failure can cause check engine light to come on and for the vehicle to possibly perform poorly. -Front rotors commonly warp causing a vibration through the steering wheel when braking. Machining the rotors will help vibration. -Failing speed sensor drive gear sometimes causes a surge and can turn on Check Engine light when using cruise control. Transmission replacement will fix. -Using the wrong oil in the rear differential on four wheel drive equipped models will cause a "chattering" sound and vibration on turns. Use only approved Honda differential oil. -A groaning sound coming from the rear differential when going through turns may be from the differential fluid breaking down. -Rear trailing arm bushings often crack and break. Replacing the bushings will fix. -Clunking noises can be heard from the front suspension. Possible cause is the flange bolts for the upper control arm needing to be tightened or replaced. -Some models have a faulty water pump bearing which causes a growling noise in the engine. -Corrosion between the rear calipers and pads can cause a griding sound. Lubricating and a cleaning will eleviate the noise. -Warping rotors can cause a vibration through the steering wheel when braking. Machining will fix. -Faulty fuel filler cap may make the Check Engine light come on. Replacing the fuel filler neck will fix. -Some models have a faulty Fuel Tank Pressure sensor and may cause the Check Engine light to come on. The sensor needs to be replaced to fix. -Faulty variable valve timing valve can cause the Check Engine light to come on. A Honda software update will fix. -Some models can misread Air Fuel sensor information and cause the Check Engine light to come on. A Honda software update will fix. -A poorly adjusted tailgate or switch may cause the tailgate light on the dash to flicker. Adjusting the door and or switch will fix. -Warping rotors can cause a vibration through the steering wheel when braking, Machining will fix. -Some models computer misreads the coolant sensor information and turns the Chaeck Engine light on. A Honda software update will fix.